Leg cramps causes awful pain. It remains for less than a minute or tortures you for a longer time. Most of the men and women suffer from the leg cramps usually at night. Leg cramps occur when there is a involuntary contractions of the leg muscles. The leg cramps occur in the calf muscles, thigh muscles along with the hamstrings and quadriceps. Most of the time, it happens in the pregnant women but it usually attacks both of the children and adults. Some of the exercises that are heavily done on the leg muscles are the cause of the lower leg cramps. Such as the recreational running, weight training with the help of the legs or sports that needs lots of running task. Other things that may cause the leg cramps are nutritional deficiencies, dehydration, kidney failure, muscle fatigue, alcoholism, thyroid issues, Type 2 diabetes, being overweight, imbalance of electrolytes, hormonal imbalance, vascular disease, neural disorders and restless legs syndrome. The best thing is when you have a leg cramp, you can engage in some kind of physical activity at the meanwhile. Simplest exercise is you can start walking and the pain will be gone. Walking helps you to bear the pain and you will feel better soon. Walk sends a signal to your brain that your muscles are now need to contract and then relax so it is helpful to ease the tighten muscles and provide relief from the discomfort. When you feel a leg cramp, immediately stretch the affected area for about 30 minutes, then gently massage the area as to relax the tighten muscles. Another thing you can do is simply walk around to ease the muscle tightness. At night, when you feel a leg cramp, stretch your leg muscles before getting to the bed. The best thing would be riding a bicycle for about 10 minutes before sleeping. Massage is an effective treatment for leg cramps. Massage increases blood circulation in the tissue from which new fluid makes the tense muscle relax. You should remember that massage can cause lots of pain at the start but soon gradually it will be slow down and at last it will be gone completely. Apply the warm olive or coconut oil to the cramped leg. Massage the muscle with long strokes of your fingers until it becomes relaxed. After that, wrap the area with a warm towel and leave it for few hours. Repeat the process as you need. Epsom salt soak is the ancient remedy for leg cramps. Epsom salt contains magnesium and promotes relaxation and healing and therefore, it helps in reducing the discomfort of leg cramps. The Epsom salt bath completes the magnesium requirement in your body which is a common cause of cramps. Now add 2 cups of Epsom salt and stir it thoroughly. Soak your affected leg in this bath for 20 minutes. Take this bath once and you will get relief from leg cramps. Apple cider vinegar is an effective remedy as it has a rich potassium content to help the intensity of the pain due to leg cramps. Apple cider vinegar controls the fluid balances in your body and prevents dehydration, a common cause of leg cramps. To ease the cramps, mix 1 tbsp of apple cider vinegar in a glass of warm water. 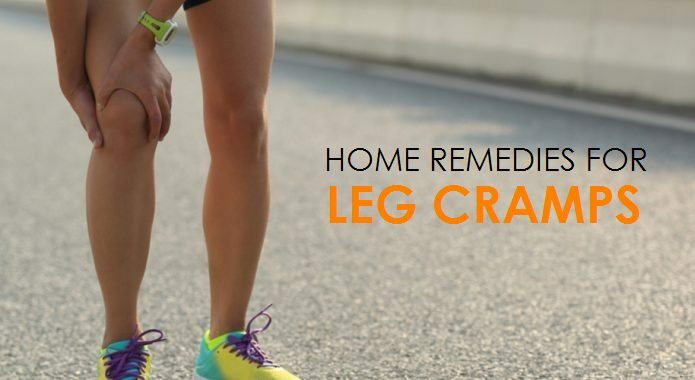 Drink this tonic to get rid of the leg cramps. Alternatively, add 1 tsp of apple cider vinegar, 1 tsp of honey and 1 tbsp of calcium lactate in half glass of warm water. Drink this solution before you going to bed to prevent the problem. It is an old-age remedy for leg cramps. It is rich in potassium, iron, calcium, vitamin B6, selenium, manganese. It helps in tighten up the muscles, reduce the discomforts. Mix 2 tsps of blackstrap molasses into 1 cup of warm milk. It sounds strange but people have said that it is great remedy to get immediate relief from leg cramps by simply eating a spoonful of yellow mustard. Its pungent taste is actually triggered the neuronal stimulation which helps in regulating the nerve function by influencing the nerves causes the leg cramps. Eat 1 tsp of yellow mustard as you experience the leg cramp. It will relief the pain within a minute. If you never find the yellow mustard then you can try the ounce of pickle juice. Apply warm compress to the area of your leg that is feeling cramping a lot. Heat helps in relaxing the muscles and reduces pain, tightness or cramping. Place a heating pad over the cramped area until you feel more comfortable. Another option is soak a towel in warm water, squeeze out the excess and place it on the cramped area until the towel becomes cool. Repeat every few minutes until the pain is gone. One of the main causes of leg cramps is the potassium deficiency. Potassium works with sodium as an electrolyte to maintain your cell’s electrical charges. Proper charging helps to control the contractions and relaxation. When your body contains low potassium, the cells will not be able to control the muscle contractions, which is the cause of leg cramps. Make sure you eat diet containing potassium like bananas, apricots, grapes, cabbage, broccoli, grapefruit, pork, lamb, fish, dates, etc. Magnesium deficiency can also cause leg cramps. Doctors often suggest the pregnant women to take magnesium for treating muscle cramps. Magnesium aids in the absorption of potassium, important for muscle functioning. Get your magnesium level checked if you experience a leg cramps. Take magnesium rich diet like pumpkin seeds, almond, spinach, kale, bananas, soy milk, walnuts, potatoes, cashews, tofu, beans, and blackstrap molasses. You can also take magnesium supplements but after consulting your doctor. Dehydration is a big problem and a common cause of leg cramps, drink adequate amount of water throughout the day. Water is very much important for muscle health. Drink 8 glasses of water to prevent dehydration and cramping. Check the color of urine, if it is clear then it is a good sign of adequate hydration. You can have fresh vegetables and fruits juices along with water to enhance the amount of water and to prevent from the leg cramps. Avoid drinking too much coffee, alcohol and carbonated beverages. Eat fermented food as it is helpful for leg cramps to be eased. Take 1 tbsp of brewer’s yeast per day for improving the blood circulation. Stay away from alcohol as it causes dehydration which is a common cause of leg cramps. Wear proper footwear while doing exercise. Drink a glass of warm milk before getting to bed. Drink herbal teas like ginger, chamomile or raspberry tea as it will work excellently for reducing the leg cramp.